Have you ever looked at a map and thought, “I wonder what that part of Oregon is like.” or driven through the scenic areas of our great state dreaming of riding your bike there? Or wished you could ride your bike for days on end without having to worry about a thing? Then Cycle Oregon is for you. This seven-day adventure takes you on a journey through the serene landscape with full support and a new overnight stay every day. Imagine a village that picks up and moves every day, it’s kind of like that. You camp in the village with your own tent, or provided tents with a set up service. Don’t worry about carrying a thing – Cycle Oregon takes care of carefully transporting your gear for you every day. Each day’s course is around 75 miles of riding – some shorter, some longer – and there are distance choices at times. Most riders arrive to camp by the afternoon, so there’s plenty of time to enjoy a snack, have a fresh fruit smoothie and relax with new friends. Acupuncture, massage, get your bike checked out, take a HOT SHOWER! – it’s all there. Delicious dinners are served every night, there’s entertainment on the stage, a beer and wine garden and late night snacks for the party animals who can handle staying up after such a rewarding day. All your meals are included, the snacks are plentiful and the support is top notch. 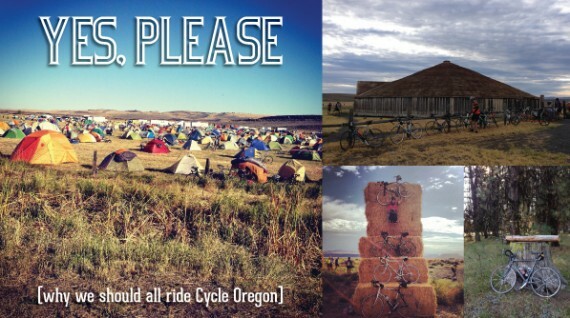 You won’t really WANT for of anything on Cycle Oregon, except, perhaps, another week of riding. The Cycle Oregon week long ride happens only once a year and some years it sells out. Register now to ensure you secure a spot on this iconic Oregon ride. Looks great.I follow you guys from Iowa but this is one of the rides I’m now considering doing this summer. YES PLEASE this could be very fun. I’ve been curious about this ride for years. Seems like you get a lot for the ticket price. I’d like to hear what other people who have done it have to say. I rode Cycle Oregon for many years. Had surgery on my knee and my dr. wouldn’t clear me to do such a long ride – until now. Looking forward to being out there with you all this summer. best ride. hands down. This ride has “Favorite Ride” status in my friends circle.